Hmmm...another futuristic movie with Priyanka chopra again! (I dont know wat's it wit piggy chops and sci-fi flix, i mean they are almost evolving into a new species or something!!??) .. I just added for your viewing pleasure!) and quite frankly wasn't very impressed by what i saw. Being a sci-fi thing, the first thing one looks forward to is the ambience and graphics presented (very unlike wat our dear friend Harry..the Baweja guy folks dont tell me u forgot??... would like us to presume from the looks of Love Story 2050..i watched that movie in 5 mins flat and still managed to hate it enough not to see anything related to it again...was so bad it made Saawariya look a classic!!! )....Well enough blah on the old flick..we discuss the matter in hand. 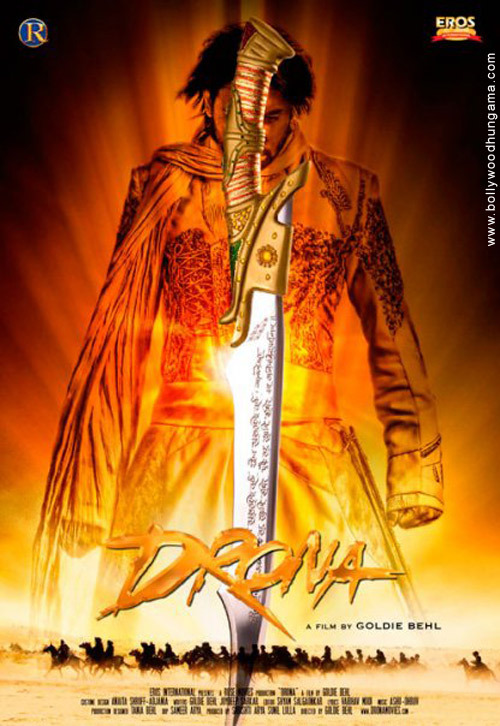 Drona..
site to all the promo pix of it doing rounds of the web. even after the prepostorous lifting of the famous desert storm scene from the Mummy, the graphics fails to hit the spot, it simply looks from a bygone hollywood era.